Tumors originating from different components of peripheral nerve sheath are accordingly defined as schwannomas, comprising schwann cells; neurofibromas that show admixture of schwann and fibroblastic cells; and perineuriomas, originating from the perineurium. The malignant counterpart of a nerve sheath tumor is termed as malignant peripheral nerve sheath tumor (MPNST). , Lately, benign nerve sheath tumors comprising more than one component have been objectively identified with immunohistochemistry (IHC) and ultrastructural analysis, including a schwannoma/neurofibroma and the recently identified, hybrid schwannoma/perineurioma, that displays alternate arrangement of schwannian and perineurial cells. Further, on IHC, S100-P highlights schwannian cells and epithelial membrane antigen (EMA) delineates peineurial cells. , Accordingly, MPNST showing schwannian differentiation (S100-P positive) and MPNST with perineurial differentiation (EMA positive) have been described. Hornick et al.,  described 42 benign hybrid schwannomas/perineuriomas, including few cases with degenerative atypia and mitoses, but short of a MPNST. Recently, a series of 63 MPNSTs has been documented. None of the tumors within this series included MPNST on a background of a hybrid schwannomas/perineurioma. Herein, we describe a recently encountered, extremely uncommon MPNST arising in a hybrid schwannoma/perineurioma, occurring in the thigh of a young male. Such a tumor has not been described in peer reviewed English literature, to the best of our knowledge. A 32 year old male referred to us with swelling over his right thigh of four month duration, for which he underwent surgical excision, elsewhere. He had a past surgical history of having undergone arthroscopy eight years back for a meniscal tear. There was no other significant medical or familial history. There was no history of numbness, parasthesia or any other lesion, elsewhere in the body. Clinically, his vitals were normal. Local examination revealed a thigh swelling on the anterior aspect of the lower one third of his right thigh that measured 8 × 6 cm, was fixed to deep tissues and was non-tender. There was no associated lymphadenopathy or hepatosplenomegaly. The patient was negative for neurofibromatosis (NF) status. He underwent radiological investigations, followed by a fine needle aspiration cytology that was reported as a cellular spindle cell tumor. Subsequently, he underwent surgical excision and the paraffin blocks with stained slides were submitted to us for review. Plain and contrast enhanced magnetic resonance imaging (MRI) right thigh revealed a well defined, lobulated, elliptical lesion in the anterior part of the lower thigh, beneath the fascia and superficial to the muscles and measured 7.6 × 6.6. × 3.7 cm. It showed high signal intensity on Short tau inversion recovery (STIR) and T2WI and appeared iso-intense to muscles on T1W1. Flow voids were noted within the lesion suggestive of blood vessels. Intense enhancement was seen on post contrast images at the periphery of the lesion [Figure 1]a. Preoperatively, an 8 × 6 cm sized, firm tumor was noted on the anterior aspect of right thigh [Figure 1]b. Grossly, the tumor was in form of a grey white soft tissue multinodular mass that measured 6.5 × 5.5 × 5.5 cm and had a 'slippery' cut surface [Figure 1]c. Histological examination from the different tumor nodules showed variable features. One of the nodules revealed a cellular spindle cell tumor with distinct nesting/neuroid pattern, along with focal areas comprising whorling, lamellated and fascicular arrangements. Cells within the tumor nests were oval to plump, whereas at the periphery, tumor cells were relatively elongated, spindle-shaped with elongate processes. Overall, tumor cells exhibited mild to focally moderate, degenerative nuclear atypia, including focal intranuclear inclusions, unassociated with mitosis and necrosis. No "Antoni A" pattern with Verocay bodies or perivascular hyalinisation were noted [Figure 2]a and b. On immunohistochemistry (IHC), within this tumor section, plump tumors cells displayed intense, S100P positivity, whereas elongate spindle-shaped cells at the periphery, as well as in alternating juxtaposition with the plump cells, revealed EMA positivity, but S100-P negativity. EMA highlighted bipolar processes of the elongate spindly cells. CD34 was diffusely positive. MIB 1 (proliferation marker) was low and highlighted occasional cells. p53 staining was negative [Figure 2]c-e. The other tumor sections showed hypercellular tumor comprising oval to spindle-shaped cells arranged in fascicles and whorls with diffuse, moderate nuclear atypia; mitoses ranging from ≥5/10 high power field (hpf); apoptotic debris, along with discrete areas of tumor necrosis. Perivascular collagenization was noted. 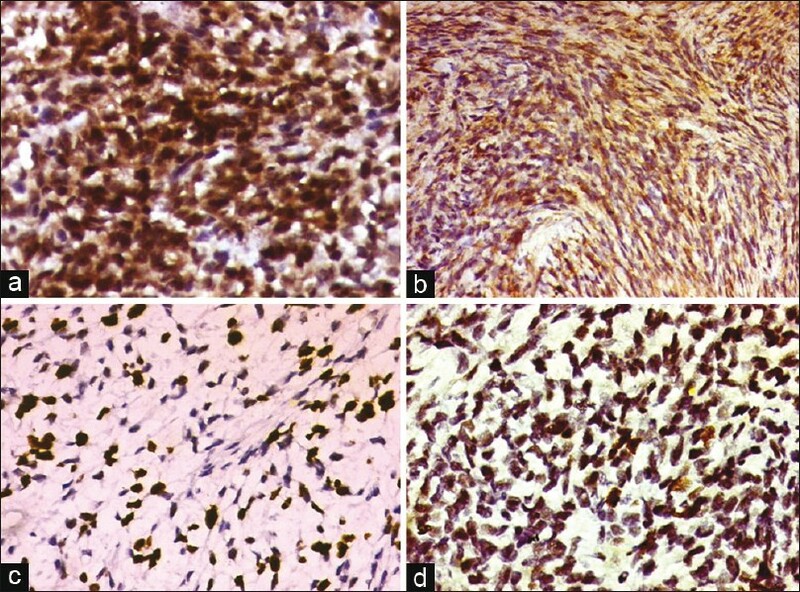 In addition, there were areas of prominent myxoid degeneration and several cells reminiscent of early epithelioid malignant cell change (EMC), including polygonal shapes, moderate amount of cytoplasm and discrete nucleoli [Figure 3]a-e.
On immunohistochemistry, one of these tumor sections showed EMA negativity and S100-P and CD34 positivity. MIB1 (proliferation marker) highlighted 30-40% tumor nuclei. p53 immunostaining highlighted 40-50% tumor cell nuclei. HMB45, cytokeratins (CK), CK7 and CK5/6 were negative [Figure 4]a-d. Diagnosis of a low-grade MPNST; arising in a hybrid schwannoma/perineurioma was finally made. As the sections from margins were not submitted, comments regarding type of resection could not be made. Metastatic work-up was advised including MRI of thigh for evaluation of residual disease, but patient declined and was lost to follow-up. The present case report is an extremely uncommon MPNST, arising within a hybrid schwannoma/perineurioma and occurring as a large and deep-seated soft tissue mass. A hybrid schwannoma/perineurioma has been explicitly described in the form of case reports and studies, including 42 cases by Hornick et al.,  wherein the authors identified this tumor most commonly in the extremities (73.8%), followed by head and neck, trunk and rarely colon, as other sites of occurrence. None of their patients showed signs of neurofibromatosis. They defined this tumor as composed of an intimate admixture of plump, schwann cells, along with alternating, slender, elongate perineurial cells, objectively identified by S100-P and EMA positivity. Like-wise in the present tumor, identified in the thigh of an adult male, one of the sections showed a similar cellular pattern, reinforced with alternating S100-P and EMA positivity, highlighting nearly equal proportion of schwannian and perineurial components. Neither in the present case, nor in any of the cases described by Hornick et al.,  were all components of a schwannomas noted. Some neurofibromas display focal perineurial differentiation, reinforced with focal EMA positivity. However, alternating arrangement of schwannian and substantial amount of perineurial components are descriptive of a hybrid schwannoma/perineurioma, as noted in the present case. , This suggests that a hybrid schwannoma/perineurioma is a distinct subtype of a nerve sheath tumor. At the same time, we identified focal areas of degenerative nuclear atypia, reminiscent of an ancient change schwannoma, as noted earlier. However, none of the earlier documented cases have described malignant change in a hybrid schwannoma/perineurioma. Hornick et al.,  identified rare mitotic figures in 23.8% cases, focal epithelioid component in one tumor, but tumor necrosis in none, leading to lack of a single MPNST within their study tumors. Malignant change in a schwannoma is rarely noted. The criteria for malignancy in a schwannoma include presence of a benign schwannoma, failure to identify a primary tumor that has metastasized to the schwannoma and presence within a schwannoma of malignant cell population. McMenamin et al.,  described 17 cases (mean age = 31 years) of malignant change in a schwannomas, including four epithelioid MPNSTs, four epithelioid angiosarcomas and 10 tumors with a characteristic epithelioid malignant change (EMC), including cells with moderate cytoplasm, uniform chromatin and discrete nucleoli. They observed intense S100-P positivity within these epithelioid cells and further postulated the tendency of MPNST to show epithelioid cytomorphology, when arising in a schwannoma. Besides, they observed coexistence of degenerative atypia with EMC. At the same time, Hornick et al.,  noted epithelioid component in one of their cases, but the other criteria for malignancy were absent. The present case fulfilled all the criteria for malignancy in a nerve sheath tumor. The tumor tissue section showing features of malignancy displayed focal degenerative atypia, as was noted in the benign tumor. In addition, focal myxoid change, several epithelioid cells and prominent S100-P positivity, reinforced schwannian differentiation of the MPNST, in this hybrid schwannomas/perineurioma. EMA was absent in the sarcomatous areas. A cellular schwannoma remained the closest differential as it shares overlapping features with a low-grade MPNST, including Antoni A areas, cellular whorls, lymphoid deposits, perivascular cuffing and mitotic figures. While some of these features like whorls and mitotic figures were noted in the present case, as are seen in a MPNST, additionally, diffuse cellular atypia within the malignant tissue section and focal discrete necrosis, myxoid change and EMC within cells, led to diagnosis of a MPNST, in this hybrid schwannoma/perineurioma. Further, high MIB1 and p53 positivity in the malignant area, in contrast to the benign tumor area, reinforced the diagnosis. Discrete morphological appearances in different tissue sections with specific IHC results, especially cytoplasmic expression of EMA in spindly cells, reminiscent of perineurial differentiation, in the former tissue section and lack of the similar marker expression, along with epithelioid cell change, diffuse S100P and p53 positivity along with high MIB1 staining in the other tissue section, was supportive of malignant transformation (MPNST) in a hybrid schwannoma/perineurioma, rather than a 'pure' low grade MPNST. Besides, negativity of other epithelial markers like CK, CK7 and CK5/6 ruled out a soft tissue myoepithelial neoplasm. HMB45 negativity ruled out a melanoma. Besides discrete S100-P and EMA positivity, invariably, CD34 staining is also noted in hybrid perineurioma/schwannomas, as noted in the benign and malignant areas of the present tumor. Whereas Hornick et al.,  attributed CD34 staining to perineurial cells, Weiss et al., suggested that CD34 defines indigenously occurring dendritic cells within the endoneurium of peripheral nerves. As CD34 is a myeloid progenitor cell antigen that is also present in dermal dendritic cells, endothelial cells, and some fibroblasts, it is possibly implicated in malignant transformation. To sum up, the present case describes a yet another setting of a MPNST, from a hybrid perineurioma/schwannoma. 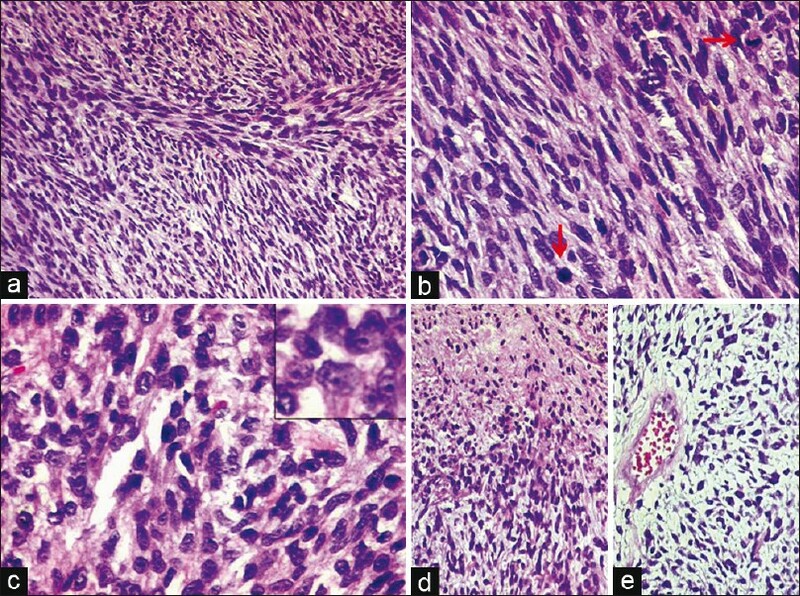 Epithelioid cell change, schwannian differentiation (S100-P positivity), along with CD34 expression probably constituted as significant components during malignant transformation in the present case of a hybrid schwannoma/perineurioma. The therapeutic value of diagnosing a MPNST in the present case is related to its relatively aggressive disease course. Therefore, at least a complete surgical excision with free resection margins was necessary in the present case. However, the patient was lost to follow-up. 1. Scheithauer BW, Louis DN, Hunter S, Woodruff J, Antonescu CR. Neurofibroma. In: Louis DN, Ohgaki H, Wiestler OD, Cavenee WK, editors. WHO Classification of Tumors of the Central Nervous System. Lyon, France: International Agency for Research on Cancer; 2007. p. 156-7. 2. Daimaru Y, Hashirnoto H, Enjoji M. Malignant peripheral nerve sheath tumors (malignant schwannomas). Am J Surg Pathol 1985;9:434-44. 3. Feany MB, Anthony DC, Fletcher CD. Nerve sheath tumours with hybrid features of neurofibroma and schwannoma: A conceptual challenge. Histopathology 1998;32:405-10. 4. Hornick JL, Bundock EA, Fletcher CD. Hybrid schwannoma/perineurioma: Clinicopathologic analysis of 42 distinctive benign nerve sheath tumors. Am J Surg Pathol 2009;33:1554-61. 5. 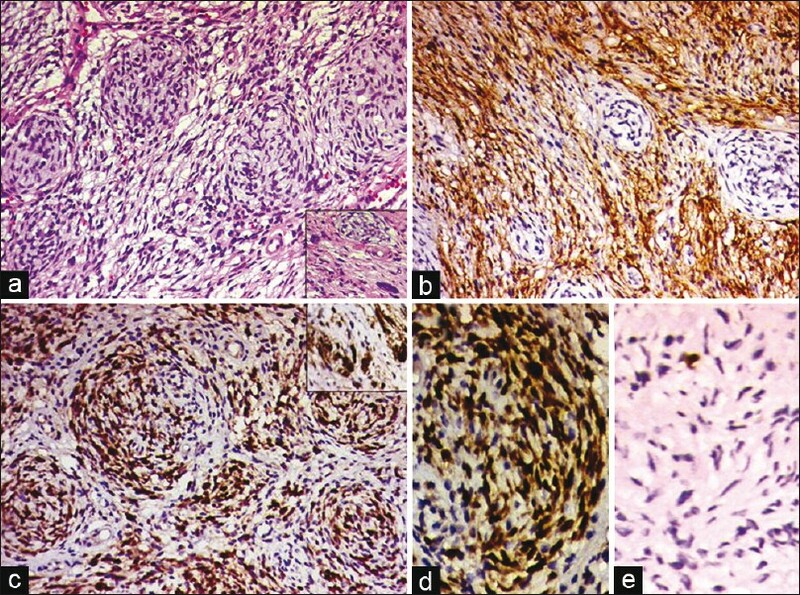 Hirose T, Scheithauer BW, Sano T. Perineurial malignant peripheral nerve sheath tumor: A clinicopathologic, immunohistochemical, and ultrastructural study of seven cases. Am J Surg Pathol 1998;22:1368-78. 6. Rekhi B, Ingle A, DeSouza MA, Kumar R, Dikshit R. Jambhekar NA. Malignant peripheral nerve sheath tumors: Clinicopathological profile of 63 cases diagnosed at a tertiary cancer referral centre in Mumbai, India. Indian J Pathol Microbiol 2010;53:611-8. 7. Woodruff JM, Selig AM, Crowley K, Allen PW. Schwannoma (neurilemoma) with malignant transformation. A rare, distinctive peripheral nerve tumor. Am J Surg Pathol 1994;18:882-95. 8. Mc Menamin ME, Fletcher CD. M. Expanding the spectrum of malignant change in schwannomas: Epithelioid malignant change, epithelioid malignant peripheral nerve sheath tumor, and epithelioid angiosarcoma: A study of 17 cases. Am J Surg Pathol 2001;25:13-25. 9. Woodruff JM. Cellular schwannoma and its necessary distinction from malignant peripheral nerve sheath tumors and sarcomas. Pathol Case Rev 1998;3:118-22. 10. Weiss SW, Nickoloff BJ. CD-34 is expressed by a distinctive cell population in peripheral nerve, nerve sheath tumors, and related lesions. Am J Surg Pathol 1993;17:1039-45. 11. Hirose T, Tani T, Shimada T, Ishizawa K, Shimada S, Sano T. Immunohistochemical demonstration of EMA/Glut1-positive perineurial cells and CD34-positive fibroblastic cells in peripheral nerve sheath tumors. Mod Pathol 2003;16:293-8.